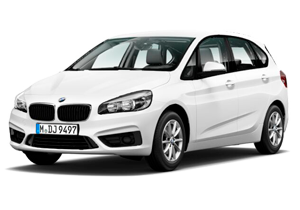 BMW 2 Series Active Tourer is clear proof that the compact size, functionality, and flexibility can be perfectly combined with a dynamic design. Doing sports, traveling on weekends or everyday trips – this car always looks forward to the road to go, and its dynamics fully meets the standards of BMW. With compact dimensions, the car has a very spacious interior and a spacious trunk. Rent a car BMW in Prague – an excellent solution for a comfortable journey in the Czech Republic and Europe! Book BMW 218i in one click! or fill out the booking form completely!